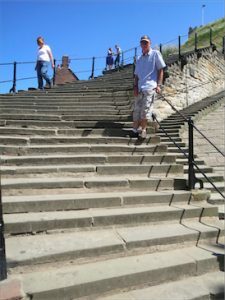 My guest today is UK author Graham Higson whose book about a small Yorkshire fishing village in 1915 attracted my attention because my husband John and I were walking those very spots in July last year. Alana: Graham, welcome. 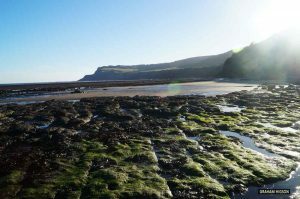 Wyke Bay, the fictional setting for Flither Lass, is based on Robin Hood’s Bay, which is the end point for the Coast to Coast walk that John and I did. We loved the place. Why choose that spot? Graham: Thanks, Alana. Because you’ve been there you’ll be able to appreciate the timelessness of the village, which is very much as it was in the story’s time period. Then there’s the coastline, and the beaches teeming with rock pools. I could see the characters tramping through the streets, sense their hunger, feel their anguish. It was as if they were there every time I turned a corner. 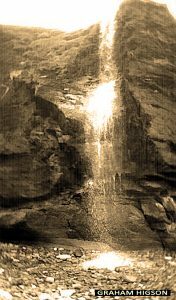 And when we walked along the beach and saw a cliff top waterfall, I knew that I would use it in the story. So yes, it’s very much like the fictional Wyke Bay, but I had to write in some differences because if readers think that a place is real, then they might (heaven forbid) believe that the characters are also based on actual people. Alana: On your website you talk about visiting Whitby, which is close to your setting of Wyke Bay. I bought a silver and jet bangle there to commemorate our walk. Unfortunately I didn’t have time to get used to wearing it because it was stolen less than a month later. 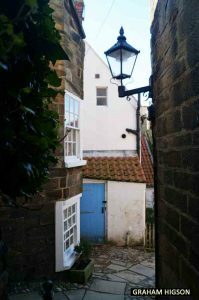 But you say that although living nearby all your life it wasn’t until you were an adult that you visited Whitby. Alana: It is! W Hamond. Guarantees that it uses only genuine Whitby jet. 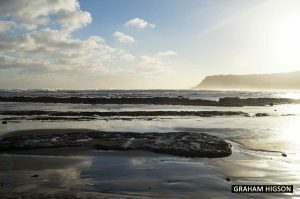 Graham: That’s it … and I’m pleased to say that on a couple of occasions I have run up those two at a time without stopping. Alana: I doubt that I could have done that. Quite a feat! Graham: Yes, but dare I do it again …? 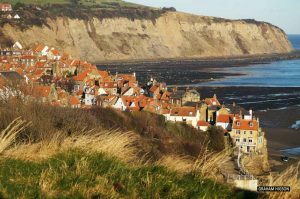 So why did it take us so long to visit Whitby for the first time? It is in a part of England that we’d not yet got around to. It’s as simple as that. Alana: So where is home? And why is it home? 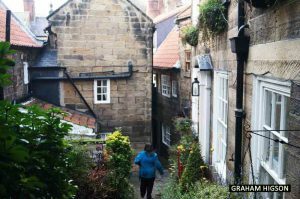 Graham: Home is in an outlying Pennine village in Yorkshire, about half an hour from Leeds in one direction and Manchester in the other. It’s all open countryside, which we like, even though you can be held up by cows crossing the road for milking, and there is plenty of wind and rain. Come to think of it, it’s very much like the village where my character Briscoe lives in Oak Seer. Alana: There’s nothing quite like using what you know! You’ve been a journalist for most of your life, I believe; although if I’m not wrong you’re a fulltime writer, as in author rather than journalist, nowadays. Graham: Yes, I gave up my day job so I could write fulltime, but in and amongst I decided to complete my education. I trained as a screenwriter at University College Falmouth, which I think taught me much more about things like structure and dialogue. I was the only one taking screenwriting, by the way, which meant that the tutor had no one else to pick on but me. Alana: But think of all that one on one! Invaluable! And nowadays you’re involved in the republishing of another local author, Leo Walmsley, who lived 1892-1966. Would you tell us a little about him and what you’re doing. 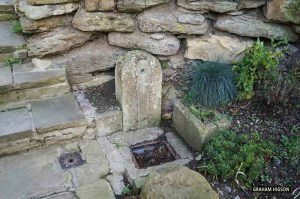 Graham: I found Robin Hood’s Bay in about 1989, and there was this cottage with a blue commemorative plaque above the door saying that an author once lived there. I thought, “Crikey, I’ve never heard of him”. I really believed they were grasping at straws for tourism purposes, although my wife Margaret was certain she had read one of his books. 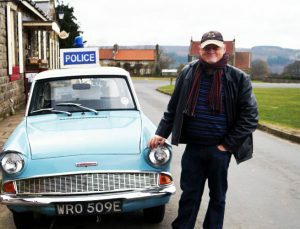 But then there was a television program about the village that mentioned a major film had been shot there in the 1930s. There was no Internet back then (not for civilians, anyhow) and it was whilst asking around in the village that I found the film, Turn of the Tide, was based on a Walmsley book. We bought the book, Three Fevers, and six years later joined the Walmsley Society. Two years after that my wife and I were voted on to the committee. At that time none of the major publishers were printing his books, and it was me who said we should do it ourselves. Here we are, 11 books republished and another on the way. Very satisfying. Alana: Do you have a link that anyone interested can take to check them out? Alana: Let’s talk about your books now. 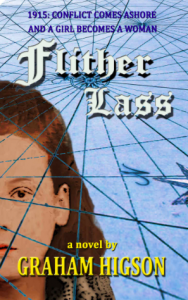 Flither Lass, which I’ve just read and reviewed, to begin with. Give us a flavor of the story line. I have to say I love the video trailer for it. I called the book atmospheric. Well, so is the trailer. Perhaps you could also explain what a flither is and what they were used for. 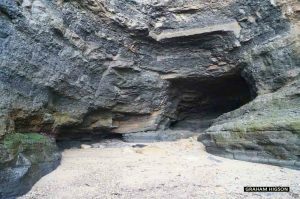 Graham: In the 1800s, maybe even farther back, many flither girls traveled in gangs, but in 1915 my flither lass Amy works alone, often in harsh weather conditions as she scours the shore for limpets, or “flithers”. 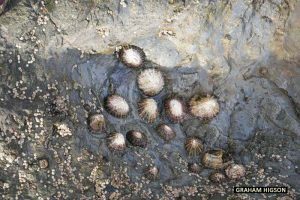 These are the mollusk-type creatures that live inside the conical shells usually found sticking to the rocks, almost with the strength of industrial adhesive. She collects them to use as bait on her father’s fishing lines. Hardy, strong, practical, she is an expert at climbing steep cliff faces, and refuses to allow her highly impractical long skirt prevent her wading out into the water. Instead she simply rolls it up to her waist, despite exposing her bare thighs –quite shocking for those times. 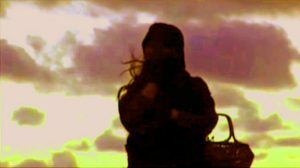 But she is estranged from the local community which believes, in its ignorance, that she is backward, slow-witted. The reality is that she is a wild, unruly girl, passionately protective of the small bay that she believes is hers. She works things out by instinct and whatever else she can pick up from odd snatches of conversation that are not obscured by an undiagnosed hearing condition. You wouldn’t get that sort of thing happening nowadays, would you? Naturally, sometimes she gets things wrong. The story begins when her father is caught in a storm, leaving her with no-one apart from a hard, embittered mother and an idle sister. Convinced that her father is still alive she searches the shore, and instead finds an injured man. He’s not her father but for the time being he’ll do, and she decides to keep him for herself. The First World War is waging in France and Belgium and only a few hundred yards out from the coast at Wyke Bay merchant shipping is under threat from mines and U-boats. And Amy’s new friend is German. Alana: The book’s a corker. I don’t hand out 5 stars easily but Flither Lass deserved them. And your other book? 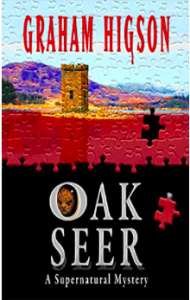 Graham: Oak Seer (a supernatural mystery) is about an obsessive who deals in old wooden artifacts. One night he finds he can no longer handle these wooden items without being haunted by images from the past. He’s something of a Lothario, doesn’t much like people, yet women throw themselves at him … and suddenly he can’t perform, so he’s washed up, whichever way you look at it. There’s a modern day high priestess of a coven in Scotland, women who lust after an ancient medieval carving of a monster’s face, blood loss, and a girl in a white dress. And poor old Briscoe must take a look at himself and do the right thing to save them. But what is the right thing? And is he so set in his ways that he won’t be able to exorcise the past? Or is it that the past is exorcising him? Alana: Sounds like he’s got some real problems! Are you working on anything else at the moment? Graham: Yes—a memoir, would you believe? It’s based on the magazine column I wrote for over 10 years and is about the observations from behind the counter of an independent hardware store. This time there’s an underlying theme with much more at stake. I’m reluctant to describe it as funny because those readers who don’t find it as such then give bad reviews, but I can tell you that it is meant to be a little humorous. I’ve just completed the first draft and it’s been a pleasure getting reacquainted with the characters I’ve known for so long they almost write themselves. Naturally, being a memoir, there are some real people in there, but their names have been changed to prevent lawsuits. Alana: Graham, thank you so much for chatting with me today. Graham: And thank you, Alana, for having me. I’ve rather enjoyed being here with you.